So said Vikas Khanna, the Michelin-starred Indian chef and host of MasterChef India. I love this quote, and I fully agree with him. Food does bring families together, and last Sunday it brought two of Livingstone’s oldest Indian Zambian families out to the farm. 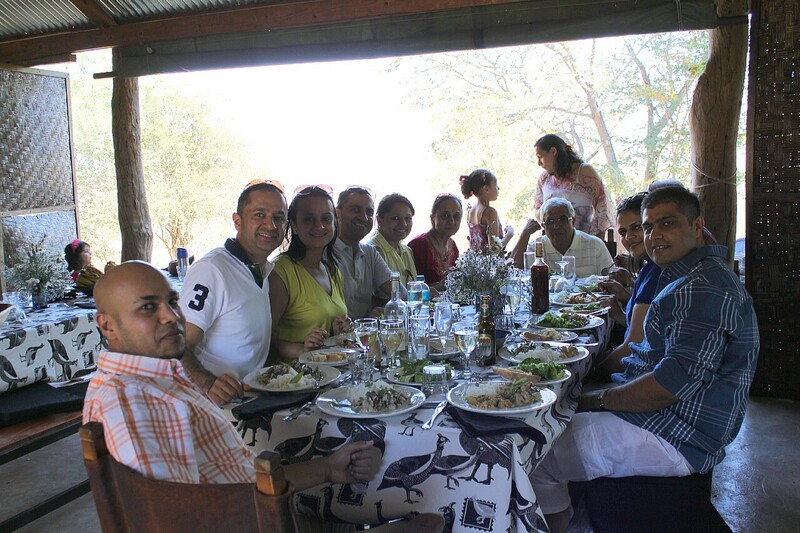 Three generations of Parbhoos and Bhukans arrived with their friends for a garden-to-table lunch. 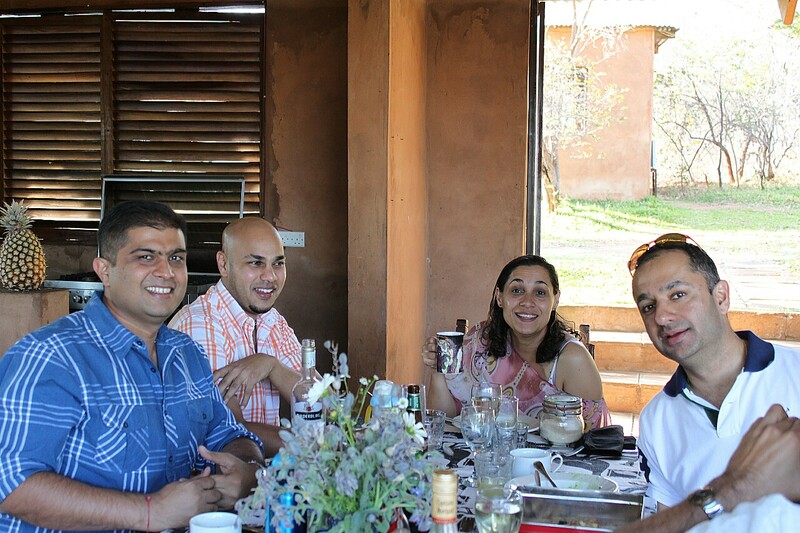 The Parbhoos & Bhukans enjoying Sunday lunch with their friends here at the farm. Our main course included a Thai Green Chicken Curry, a Thai Red Vegetable Curry, Jasmine coconut rice, freshly baked ciabatta bread with farm butter, and a homegrown garden salad with an Asian dressing. This was followed by a pale green Sweet Basil ice cream, a herb that is flourishing in the garden right now, which I served with pistachio nut florentines. To end the meal, we served homemade Mongongo nut biscotti with coffee. 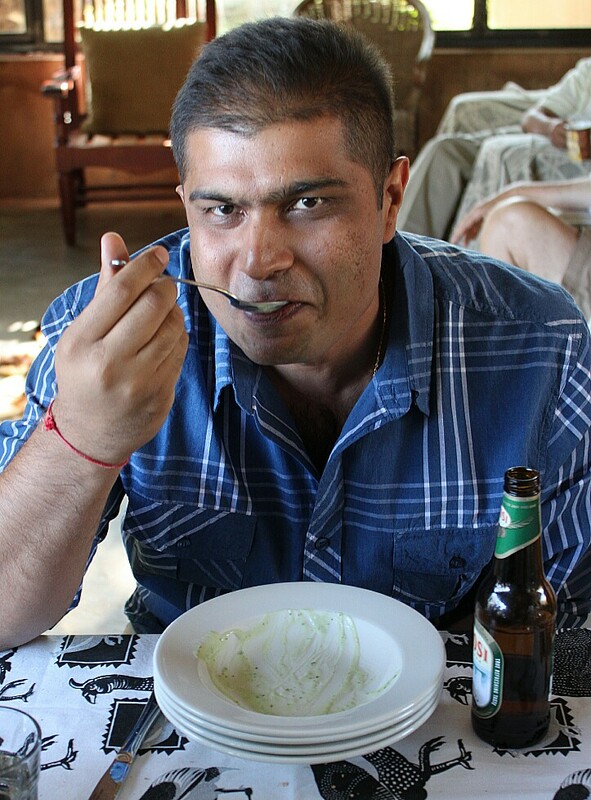 Chirag Naik finishing his fourth plate of Sweet Basil Ice Cream! There isn’t much that the Parbhoos and Bhukans don’t know about the vicissitudes of Livingstone. By all accounts they’ve seen it all. Their forebears were tailors, who traveled from India by ship to South Africa and then by train to what was then Northern Rhodesia. They disembarked in Livingstone and have lived here ever since. They have thrived and survived the boom and bust years of post-independent Zambia, tacking this way and that to keep their family businesses moving forward. 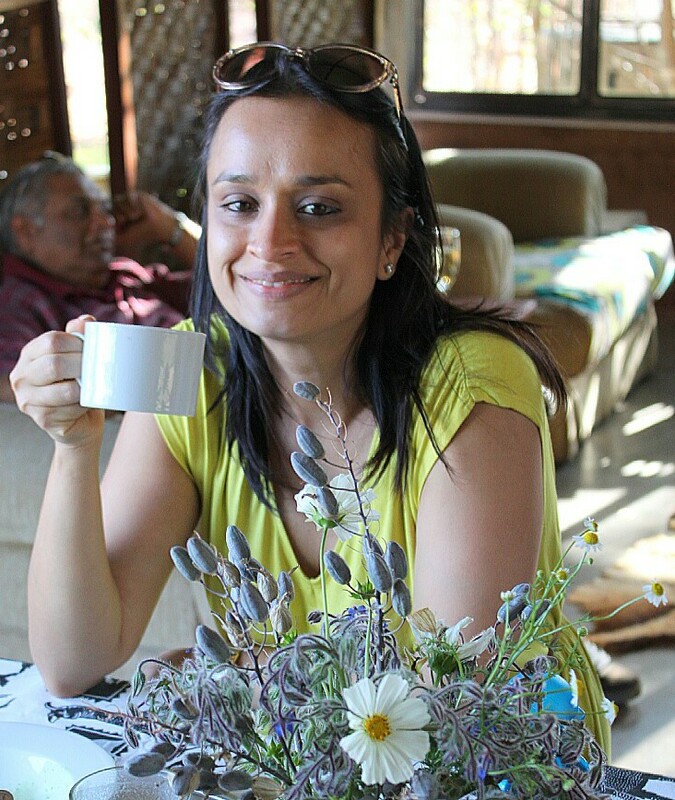 Preeti Parbhoo, the organizer of the gathering. 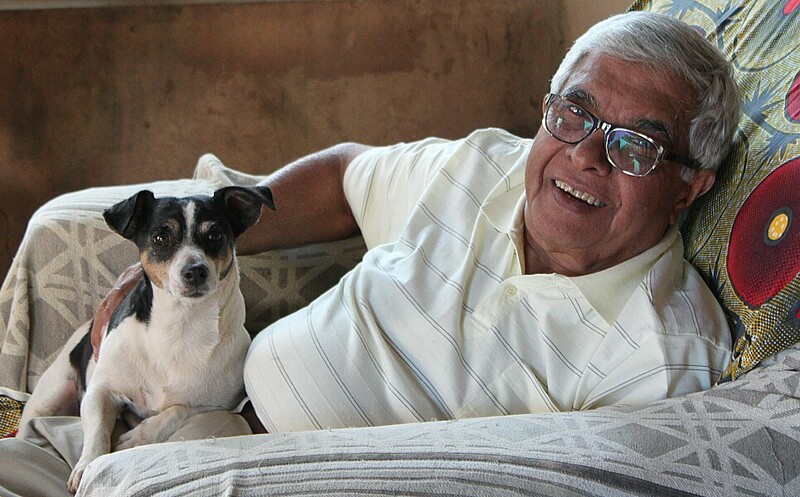 Manu Bhukan recounted to Chris on Sunday how he had to leave his Southern Rhodesian school at 16 years old when his father’s tailoring business in Livingstone burned down in 1956. Manu had to forfeit an education to help rebuild his family’s business, which later morphed into the successful Bhukan Brothers Ltd, a company that umbrellas everything from manufacturing to supplying to distribution. Jackie the Jack Russell making herself at home on Manu Bhukan’s lap after lunch. Roshan Parbhoo, a scion of his family’s business, which today includes a milk-packaging plant and a supermarket franchise, told me how it grew out of the collapse of the textile industry in Livingstone in the 1990s, after competition from East Asia proved too challenging for Zambian producers. Roshan also talked about the Chiku trees his grandfather brought to Livingstone from India back in the day. Every Diwali–the Hindu Festival of Lights–the Parbhoo family reap the fruit from their Chiku trees to turn into ice cream to hand out to the children. Roshan has promised to gift me some Chiku fruit when it ripens later in the year, which I hope to experiment with and write about in due course. Spar, the supermarket franchise owned by the Parbhoos, occupies a street corner in downtown Livingstone, a building they moved into two years ago. “Quite by chance Spar occupies the same spot where our family-run grocery store was opened by my grandfather all those years ago, but which closed in 1990. Now we’re back.” said Roshan. Life, it seems, lives in circles. 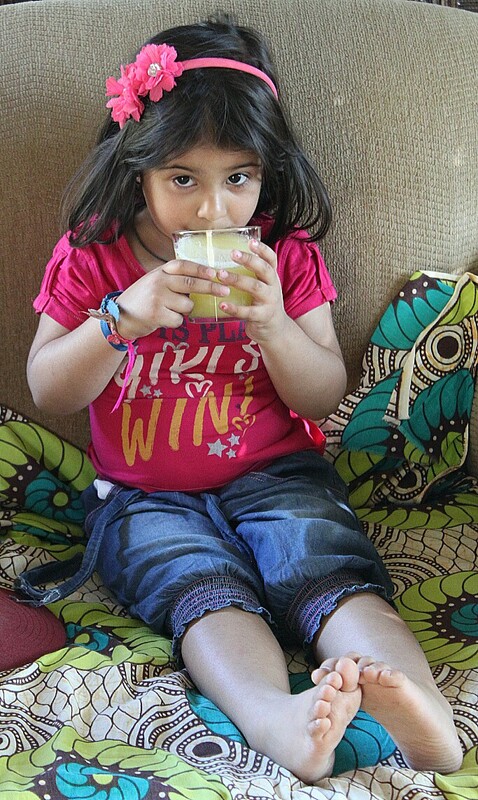 Loving the fresh pineapple juice. 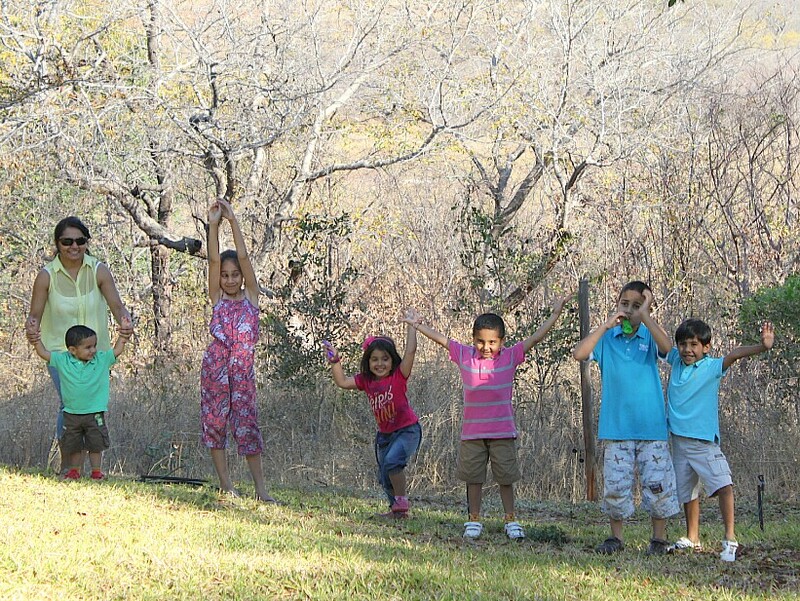 Little Livingstonians lapping up life in the bush. People – perfect! Converging from all corners of the earth with stories – the recipes of their lives. A happy gathering……except we wanted to see more of what they ate!!?? It looked good what was left on the edges of the plate…… Great photos again! Thank you, Louise. You will see what they ate … in later blog posts. Lunch for 18 (including the children) and careful food photography are a challenging combo. I don’t have enough hands! A heartwarming story of a close family. Lovely that they chose your farm for a family lunch…Go Chirag…I’m sure you have some room for a 5th plate of ice cream!! Haha, Hellie! Yes … Chirag was cleaning up all the children’s plates. Good on him, I thought! I hate waste. 😉 It was such a pleasure for us to feed them all. Love peeping into history around a table of the freshest and local food! Thank you, Katrina. I am very lucky to live (and cook and garden and forage) in this unique place!